Kids4Peace is excited to welcome Tareq Samman as Co-Director of the Jerusalem office. A Palestinian Muslim originally from the Wadi Joz neighborhood of Jerusalem, Tareq will be responsible for all youth, parent, and community programs. 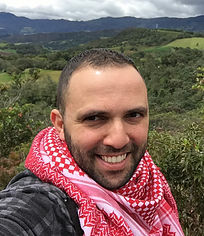 For 14 years, Tareq was a public school teacher in Kufr Aqab and then pursued masters degrees in Coexistence/Conflict Resolution and Sustainable International Development from the Heller School for Social Policy and Management at Brandeis University. He has been a volunteer with the Interreligious Coordinating Council of Israel and was a facilitator and seminar leader for Auburn Seminary’s interfaith youth program Face to Face, Faith to Faith. Tareq has taught Hebrew to Palestinians and Arabic to Israeli students. He considers language a tool of communications and bridging the gap between the two people. Tareq lives in Shuafat and has been working with Kids4Peace this summer as part of his graduate school program. Tareq will work alongside Meredith Rothbart, who will continue permanently as the other Co-Director of the Kids4Peace Jerusalem office. Meredith is primarily responsible for external relations, communications, fundraising, and strategic development. Meredith Rothbart moved to Jerusalem in 2007, and joined Kids4Peace as a volunteer in 2009. She holds an MA in Community Development from Hebrew University and a BA in Politics, Philosophy and Economics from University of Pittsburgh. Meredith’s previous work includes government relations, project management and communications with NGOs, the Israeli Ministry of Defense, and other government agencies, including projects at the grassroots level as well as national and international initiatives. She lives in East Talpiyot with her husband and children.